Michael Dickson in action at the Butler Bubble. Jimmy Lafakis/Collegian file photo. Defeat was not on the menu for the Bulldogs this past week, with both the men’s and women’s teams sweeping every match. While most of Butler’s students were away on spring break, they still had business to take care of while the school was closed. The men played three matches at the end of the past week, while the women had a pair of matches over the weekend before students returned to campus. The men played stellar as they completed three consecutive sweeps, shutting out Austin Peay on March 13 followed by Wright State and Grand Valley State two days later. Against Austin Peay, the doubles point was earned with two set victories in the No. 1 spot 6-2 (Mason Dragos / Ryan Roegner) and the No. 2 spot 7-5 (Adrian Mag / Aviv Ben Shabat). In singles, the men dominated with four straight-set victories by Dragos, Mag, Roegner, and Spencer Lang. 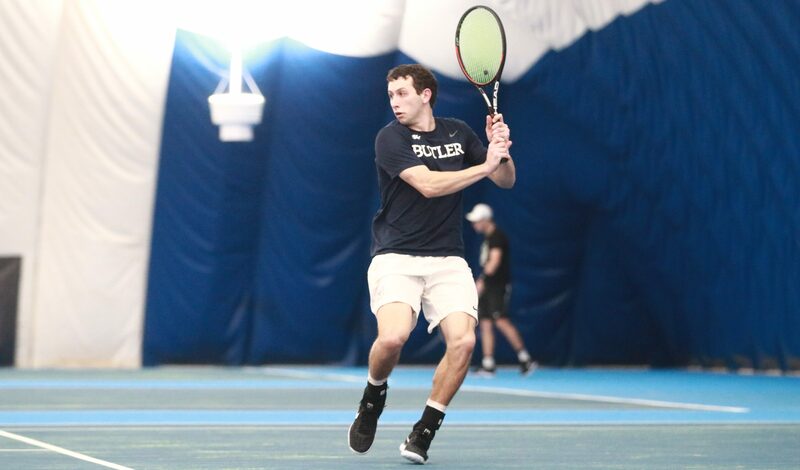 Ben Shabat and Thomas Brennan battled back after losing the opening sets in their respected matches to grab wins over their opponents, giving Butler the 7-0 shutout. The success would continue against Wright State and Grand Valley State. Butler would take the doubles point yet again vs WSU, thanks to 6-2 and 6-0 victories. The momentum would continue as the Bulldogs would grab a straight set victory from Brennan 6-1, 6-2. Lang followed with a 6-4, 7-5, in his own matchup. Against GVU, Butler would grab the doubles point with two 6-2 victories by the Ben Shabat/Mag duo and the Brennan/Lang pair. Lang would continue to find his stride with a straight set victory in the No. 4 spot 6-0, 6-2. Convincing wins from the team overall led them to yet another 7-0 victory. The men climbed to 13-4 this season to extend their win streak to nine and play IUPUI at home on March 22. The women dominated in their own pair of shutouts against Hanover College and IU-Southeast on March 16 and 17. Lauryn Padgett and Nina Bertino took the first doubles set 6-1 against Hanover, followed by a win by Kendal Wilby and Caroline McAuley 6-2, giving Butler the doubles point. The team would continue to play well in singles matches, with every matchup being won in two sets. Lauren Marx defeated her opponent without allowing a single point against her, winning 6-0, 6-0. Strong play by McAuley in the No. 4 spot gave her a 6-1, 6-0 victory. The Bulldogs winning ways would move them forward against IU-Southeast, sweeping the doubles point. Sara Linn started singles play with a 6-1, 6-0 win in the No. 3 spot. Wilby defeated her opponent 6-0, 6-0 on the No. 6 court. A victory by Hallie Leblebijian 6,1, 6-0, followed by Marx and Padgett winning their respected matches, gave the women their second 7-0 shutout of the weekend. They improve to 10-8 on the season and play at St. John’s on March 21.